A Northern Virginia man has been charged with attempting to provide material support to ISIS after allegedly taking photographs of D.C.-area landmarks for what he thought would be a terrorist attack. Haris Qamar, 25, of Burke, was arrested Friday morning, said the U.S. Attorney's Office for the Eastern District of Virginia. According to an affidavit, the FBI set up a sting operation in which Qamar worked with a friend, who was a confiential witness for the government, to film landmarks that could be targeted for attacks, including the Pentagon. Federal prosecutors say in late May, Qamar and the witness discussed ISIS's need for photos of possible targets around the D.C. area, for use in a video that ISIS was purportedly making to encourage lone-wolf attacks. Prosecutors said Qamar gave the witness ideas of where to take photos, including the Pentagon and other landmarks in Arlington and D.C. The witness picked up Qamar June 3 and drove to landmarks on Qamar's list, according to prosecutors. The witness recorded Qamar saying, "Bye-bye D.C.... kill 'em all" as he filmed the Pentagon, prosecutors said. The two allegedly met again a week later and drove to a spot in Arlington to take more photos for the ISIS video. Court records say Qamar came to the attention of authorities through various Twitter posts supporting terrorist attacks. He allegedly maintained more than 60 variations of a handle containing the word "jihadi." He allegedly posted photos of blood from beheadings and carnage of the ISIS attack on the Bataclan theater in Paris and wrote to an American servicemen he wished more veterans would commit suicide. The government witness befriended Qamar and told him his cousin was in ISIS and needed photos and videos of targets. 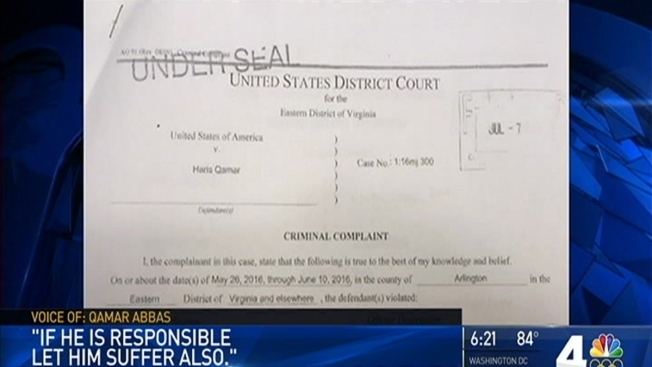 Qamar's parents told Northern Virginia Bureau Chief Julie Carey they are deeply upset and disappointed their son wasted his education and turned to ISIS. They did not go to his hearing Friday, saying he is on his own. According to court documents, Qamar's interest in ISIS led to confrontations with his father, who took his birth certificate away so he couldn't renew his passport and travel. A bond hearing was scheduled for next week. Qamar is the second person charged this week at the Alexandria courthouse with attempting to support ISIS.